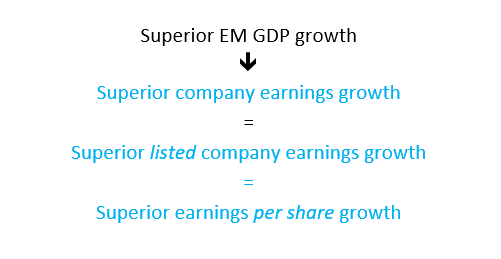 Conventional wisdom has it that superior GDP growth in EMs will produce superior EPS growth. Yet, over the last decade real EPS in India has fallen by almost 60% while real GDP has grown at over 7% p.a. We explain this ‘growth gap’ and debunk the EM growth fallacy. 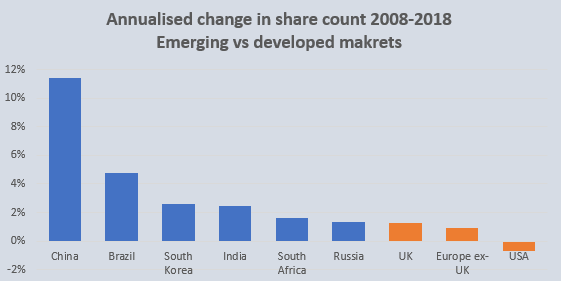 The very words ‘emerging markets’ evoke images of more rapid growth than the staid-sounding ‘developed world’. With an expectation of faster economic growth comes an assumption that this will translate into corporate prosperity and superior rate of EPS growth. However, over the last decade EPS in real or inflation-adjusted terms at an index level has, in fact, declined in four of the five largest EMs, and in three of them real EPS has halved. The absence of a causal relationship between GDP growth and EPS growth is true in all countries. However, the gap has been particularly pronounced in EMs – below we explain why. Real EPS has grown at a slower rate than GDP in each of the five largest EMs (note that we do not include South Korea as an EM as it is a member of the OECD) and by an average of 9.4% p.a. In China, EPS has grown at about the same rate as the UK despite an economy that grew 7x as fast. We highlight in blue below the ‘leaps of logic’ that many investors are unaware they are making when drawing the erroneous connection between economic and earnings growth. 1. Corporate profit share of GDP is not constant – the share of the GDP ‘pie’ accruing to corporate profits changes over time, as is the case of the share accruing to workers in the form of wages, and the share to government in the form of taxes. 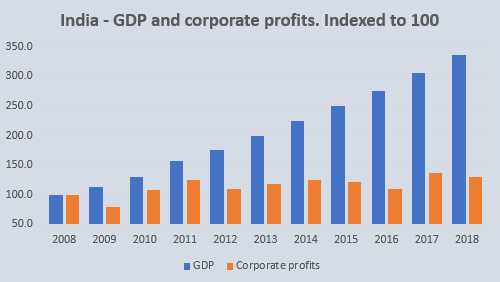 In India, for example, profits of all listed and unlisted companies relative to GDP declined from 7.8% in 2008 to 3.0% in 2018. 2. Domestic corporates and the domestic economy – companies listed in one country most often also do business outside their home market. Sales from products and services produced outside the US account for roughly 45% of revenue for the S&P500 and 70% for the UK equity market. For Tata Consultancy Services, India’s second-largest company by market capitalisation, 94% of its sales come from outside India. So, the Indian economy is going to have very little to do with Tata’s earnings. 3. Domestic corporates and domestic publicly listed corporates – in many emerging markets the finance and resources sectors account for a far larger portion of the stock exchange than they do of the domestic corporate sector. Companies drawn from the resources sector account for 17% of India’s equity market capitalisation, 14% in the case of Brazil and 71% for Russia, which compares to the contribution that sector makes to their economies of 7%, 6% and 22% respectively. So, the link between the domestic economy and net profits of locally listed businesses is weak. But what matters to investors is their proportional interest in the earnings of a company. So, it’s not earnings so much as earnings per share that count. We have to think about the change in the denominator (number of shares on issue) as well as the numerator (total profits). The number of shares on issue for an individual company may increase to fund an acquisition, fund the capital it needs to grow, or form part of employee compensation. Net profits need to grow faster than the number of issued shares in order for earnings per share to rise. The more capital-intensive the average listed company is and the lower the return on capital the greater the dilution from the issuance of new equity. Energy, mining and banking are among the most capital intensive of all sectors as they earn low through-the-cycle returns on invested capital. As we saw in the previous section, resources and financials constitute a large portion of the equity indexes in emerging markets. It is no surprise, then, that dilution from equity issuance has been far greater in emerging markets than in developed ones. This chart shows that in Brazil after-tax profits of listed companies in aggregate would have had to rise at a rate of 5% p.a. just for earnings per share at the index level to remain constant in just in nominal terms. We have shown that the economic growth of a particular country does not translate into EPS growth of listed companies in the linear, causal way many people believe. In emerging markets companies from the resources and financials sectors account for a far higher portion of the equity market than they do of the economy, so much of the local economy is not represented in the equity market. Most listed businesses operate in many countries, so economic activity from their home country will have only a partial flow-through to their profits. On top of this is the ‘denominator effort’ or the dilution to EPS caused as companies increase the number of shares on issue. Dilution has been a far greater drag on EPS growth in emerging markets, reflecting the lower average returns on investment and greater capital intensity in those countries. EPS growth in emerging markets has fallen significantly short of GDP growth over the last decade. You may feel bullish on the Chinese economy or the recovery prospects in Brazil. However, counterintuitive though this may feel, your view on an economy should have no bearing on your expectation for EPS growth from that particular country.